But the fun is just beginning! The staff is upbeat and friendly and ready to deliver a memorable experience. The pub itself is very roomy and features 6,000 sprawling square feet with a front dining room and a festive bar in the rear. There is no mistake you’re underground! The Troll Pub Under The Bridge Is A Winner! The menu is also full of fun! You’ll find exciting adaptations of pub favorites along with special Troll Pub original dishes. Every dish is a sure winner and certainly justifies repeat visits. The drink menu continues the fun with an extensive list of beers, cocktails, wines and, of course, bourbons! You must have an appetizer! The starter menu makes choosing difficult as it includes hand battered fried pickles, loaded Troll Fries (!) and Louie the Troll’s Signature Beer Cheese with fresh pretzel bread, jumbo chicken wings and even pot roast pouting. The Troll Pub Under The Bridge's Food & Drink Menus Are Creative! The Troll Pub’s creativity is not limited to their food menu. We had to try three of the house specialty cocktails. First was the Pub’s Punch. This feature sone of our favorite bourbons, Old Forester, but I’d never had it mixed with Watermelon Schnapps, pink lemonade, Pineapple juice and grenadine. This is a winner! Next came the Troll Old Fashioned and Electric Margarita. The Troll Old Fashioned was anything but that. This was my favorite with Old Forrester Signature Bourbon, house made brown sugar simple syrup, 2 splashes of bitters and finally meddled with cherries and orange rind poured over new ice. Nice! The Electric Margarita is also not your typical presentation. 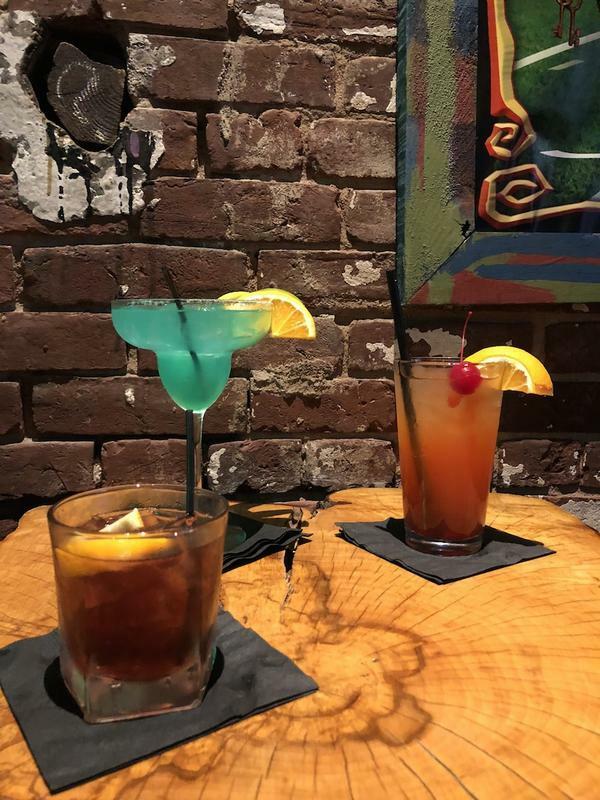 The bartenders here use el Jimador tequila, blue curacao and triple sec mixed with sweet and sour mix and a splash of Orange Juice served with salt or sugar on the rim. It tastes as good as it looks! Some of these fabulous cocktails come in an oversized 64 oz “Troll Bowl’” big enough to share with friends. Be sure to ask for details! We tried a few entrees to provide you with an adequate overview of what’s happening underground! Our favorite, and a favorite of many evidently, is the Angry Alfredo. It is impossible not to eat the entire dish. Every bite is a new experience and although you won’t leave hungry you’ll want more! Their Angry Alfredo is a special mix of penne pasta, grilled chicken, Parmesan, bacon, spinach, tomato and finished with spicy Alfredo sauce. I’ve eaten in many restaurants in our 5 Citiview markets, including NYC, and this is one of the most memorable dishes I’ve ever eaten! Another Troll Pub specialty is their Chicken and Waffles. A common menu item… but not at the Troll Pub. The waffles were freshly cooked and complimented the fried Chicken perfectly. The addition of Sweet Potato tots puts the meal over the top! But it doesn’t stop there. The house made Maple Bourbon Butter is unforgettable! Last but most certainly not least is the crowd favorite, Beer Cheese Burger. Oh my! Again, I’ve eaten a lot of burgers in a lot of place and of all types but the Troll Pub’s Beer Cheese Burger takes the prize. This large and perfectly cooked burger comes covered with savory tobacco onions, and a healthy portion of their famous beer cheese on a fresh pretzel bun. Every bite delivers! The Troll Pub Under The Bridge features an extensive menu complete with personal pizzas, incredible desserts, hearty soups and Louie’s unique sandwiches. There’s something for everyone making this a perfect stop for a casual lunch or dinner. Even better, this is the prefect stop prior to or after any event downtown including the KFC Yum! Center, Actor’s Theatre or anything else you have on the agenda. The Troll Pub Under The Bridge delivers in every way and is a must do Louisville experience. You’ll be talking about your visit for quite some time as we did…and still are. Bring your friends and double the fun! Click hear to see the Troll Pub Under The Bridge Menu! Indoor and Outdoor Casual Dining at Pizza Bar Louisville 4th Street!